The Little Red Hen is an industrious member of the poultry family. Not content to sit and digest, the Little Red Hen heads to her cupboards to decide what to make next. A can of tomatoes inspires the next culinary project - pizza. 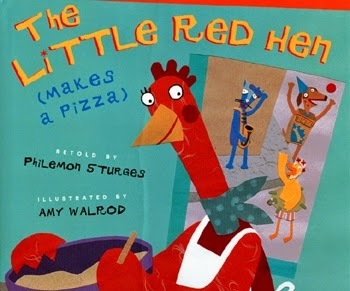 The Little Red Hen decides that she wants to make a pizza. 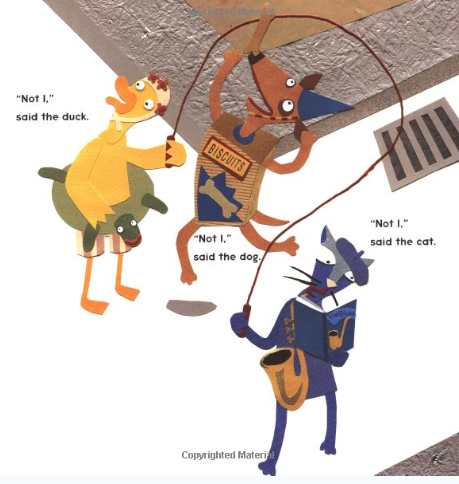 Each step along the way, the Dog, the Cat and the Duck elect not to help her, she finds that she is missing an essential ingredient, and runs to the store, purchasing far more than on her shopping list. Eventually the pizzas made and is baked in the oven - will she share? Semi-spoiler alert: the Little Red Hen does not do the dishes; she sips chickweed tea. We loved how the book "kept going in circles, but next to each other" as one of my budding literary scholars put it. When we were reading the story aloud, the kids enjoyed joining in on the repetition of "Not, I". We decided on what voices the Cat and the Dog and the Duck would use. The Duck had a nasal voice - we had to plug our noses. Yup. That was a hit. Each time the Little Red Hen checked her cupboards, she was missing an essential ingredient. A pizza pan, flour, toppings, cheese ... in fact the only thing that she had was the inspirational can of tomatoes. 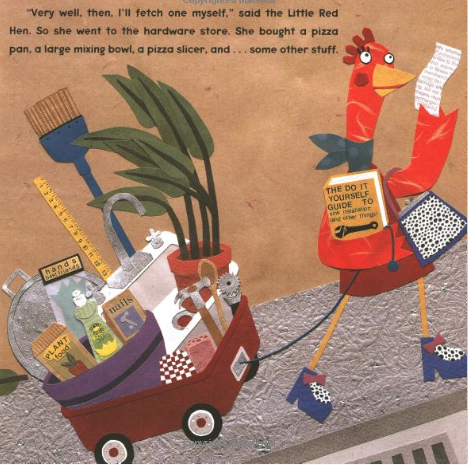 Each time that she went to the store, the Little Red Hen came home with an incredibly interesting assortment of bits and pieces. She must be the kind of impulse shopper that store owners dream of. On a teacher (or parent) note, the shopping trip items are fabulous for naming, labelling and building vocabulary. Oh for a document camera so that we could have seen the pictures "big". Amy Walrod's cut paper illustrations happily capture the absurdity of the text. I can't decide whether my favourite is the sax playing cat or the swimming float-y ring wearing duck. I love the retelling, readers' theatre and drama possibilities. And I love the possibilities of a sequel to the story. What will that busy chicken make next. First we made a Little Red Hen. I found the idea at Life in First Grade. 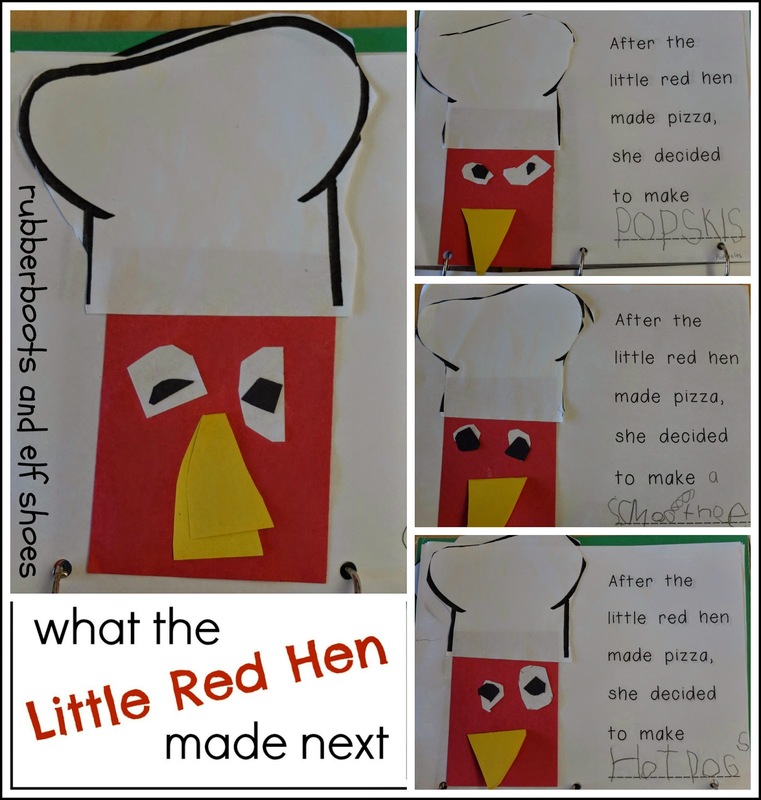 Leslie Ann has a Pizza Pack that she sells on TPT that gives directions how to make The Little Red Hen, so it would not be fair for me to pass along templates and instructions. But, I'm guessing that if I can figure it out, you can too! 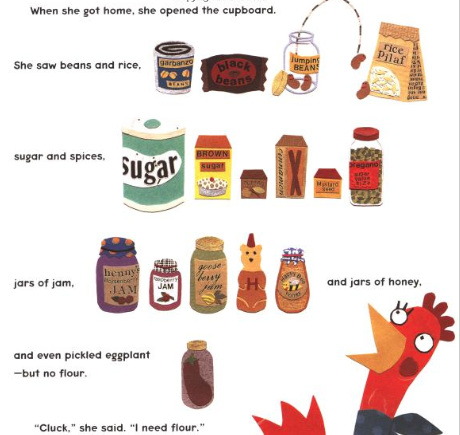 After we made our Little Red Hens, we talked about what the Little Red Hen might be inspired to make after going to her cupboard. Check out the facial expressions. It looks like the morning after a fair bit of partying in the hen house. We are writing the sounds that we hear when we write. So, popsicles looks like "popskls". I know that my students' confidence to write, to risk and to not be perfect will serve them much better than only writing the words that they know or that someone will tell them how to spell. 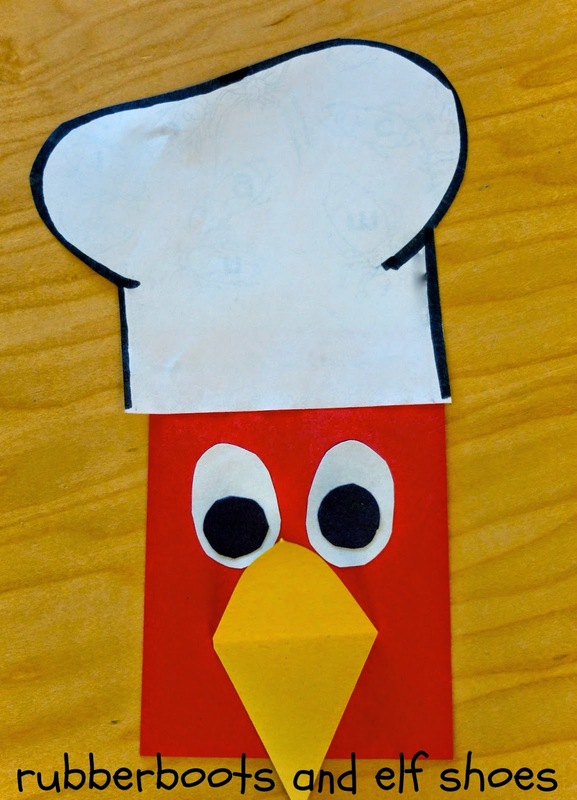 Click [here] to download a template for the Little Red Hen's next project. 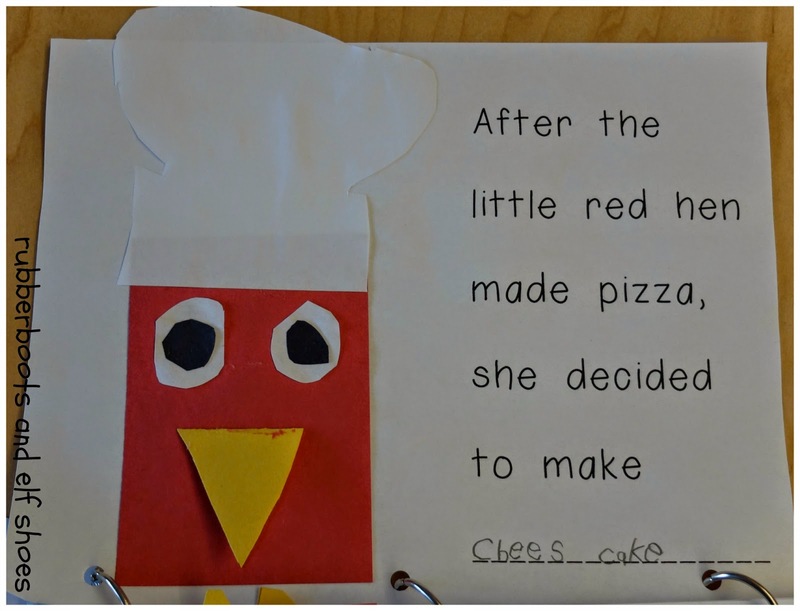 Making Learning Fun has a bunch of Little Red Hen Makes a Pizza free printables. 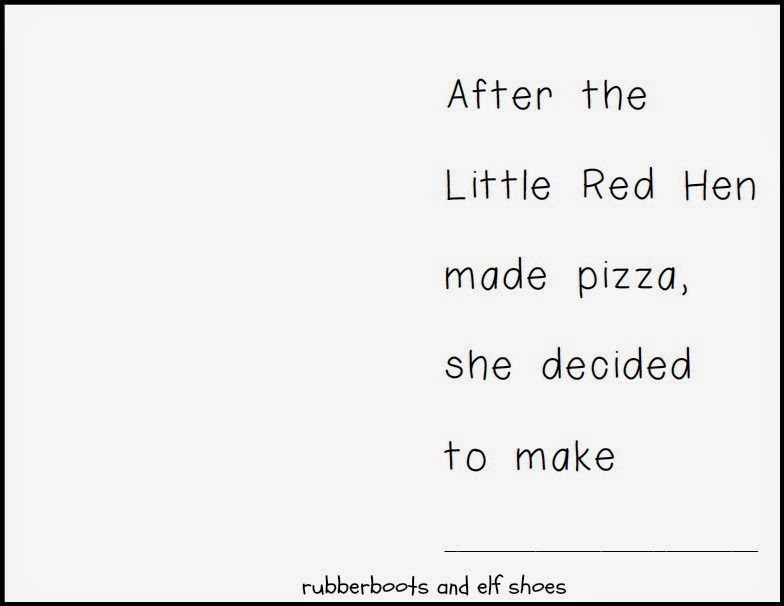 I know which Little Red Hen I choose to help with her culinary adventures. The cheese cake chicken who is buzzed on caffeine rather than suffering the ill effects of the night before. I'll help! I'll go get a spring form pan - and the cream cheese - and anything else that's needed! Very cute! This looks like a great one for retelling. I will definitely add it to my repertoire. I think you would like it Lyn. I love love love this book! I had to pin these pictures so I could remember this craft! Chickens have become the new owl for me Since getting two for my backyard, I just can't get enough of them. We wrote a story about me making ice cream floats for the class. At the end I drank all the floats and was too sick to come to school the next day! Each student had a chance to say, "Not I!" Chickens are so much fun. A little guy in my class raises chickens - we had a number of chicken visitors during the Spring. Your book sounds like a lot of fun. Hopefully you have recovered from you over-indulgence in ice cream floats. Another book to add to my wishlist! I would extend this with my second graders to include learning how to write recipes, organizing shopping lists, an economic discussion on wants vs. needs, and do coin counting word problems with her shopping spree as the plot line. i suppose I could even get some science in there if we categorized her shopping items by solids, liquids, or gases. Or- even get into nutrition. Limitless possibilities! Such a cut story! I am adding it to my list... Glad to have found your blog through the book linky--I am a new follower. Loved your kids' work samples! Too much fun! I love the emergent reader you made as well! Thanks for sharing this at Booknificent Thursday! Always love having you there! What a great book! I wish my hens would make pizza! I'd be willing to help! I love those illustrations. And you fun supporting ideas. You always have fun ideas! Thanks for sharing! You are such a good soul, Rhythm.